What are the Official ITF Approved Tennis Court Dimensions? What are the Mini Tennis Court Dimensions? What are the Other Important Tennis Court Size Regulations? What are Indoor Tennis Court Dimensions? How Tennis Court Lighting Layout Works? What are the Tennis Court Fence Dimensions? So, today we are discussing about actual measurements and overall tennis court dimensions in more detailed format. You may have been aware about the overall basic layout of a tennis court. But there are many starters and new players who are not well informed about the exact measurements that are regulated and made essential to follow by International Tennis Federation (ITF). As a tennis player, it is our responsibility and necessity to know the actual dimension for every type of tennis court out there. Therefore, today we are covering this topic in depth and making it an easy to understand complete guide for newbies and beginner level tennis players. You are free to share this ultimate guide of tennis court measurements with your friends and colleagues who are interested to start playing tennis and learn more nuances about this amazing sport. As you already know that the tennis court surface is rectangular in shape. The tennis net is placed at the center of this court surface. This divides the court into two parts. The whole tennis court area can be utilised to play both singles and doubles matches. And these tennis court surfaces are made with 4 different elements which differentiates the overall tennis gameplay style and tactics. According to ITF website, the official or standard tennis court dimensions are as follows. 6. The height of tennis net will be 3 feet (0.91 metres) in the center of the tennis court and 3 feet 6 inches (1.07 metres) at the tennis net posts. Tennis net acts as a divider and divides the court into two equal halves. 7. Then there is also an extra space on the outside of the court lines which is needed for both tennis players to run and gather the ball as and when required. This space is total 120 feet (36.58 metres / 40 yards / 1440 inches / 36576 mm) in length and 60 feet (18.29 metres / 20 yards / 720 inches / 18288 mm) in terms of its width. Mini tennis court is a great starting place to begin learning tennis for kids of age ranging from 4 years up to 11 years. Mini tennis involves smaller tennis court dimensions along with smaller tennis nets, racquets and low bounce tennis balls. This type of mini tennis includes four levels of courts such as red, orange, green and yellow. All these types are differentiated on the basis of your age and playing level maturity. The tennis balls used on the mini tennis courts are especially low bouncing and low compression types. They are much easier to handle and play for kids from 4 to 11 years. These types of mini tennis courts help kids to improve their gameplay and enhance their tennis skills so that they get ready to play for advanced level professional tennis matches. The mini tennis court dimensions and other size metric for each category are provided as follows. Red mini tennis court is used for the kids who have age less than 8 or up to 8 years. 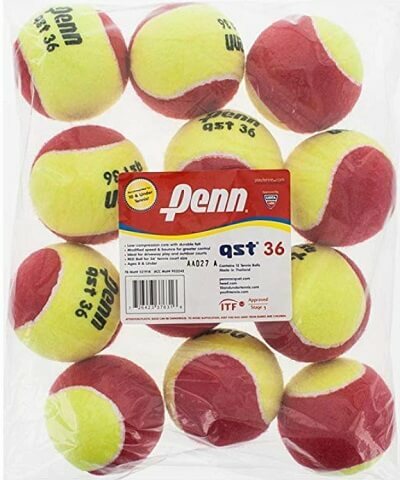 For indoor tennis matches, kids can use red sponge ball and for outdoor tennis matches, you can use red felt ball. Click Here to Buy Red Mini Tennis Court Net Online. Click Here To Purchase Red Mini Tennis Ball. Click Here To Get Red Mini Tennis Court Racket Online. Orange mini tennis courts are used for kids who have age in between 8 years and 9 years. The overall size dimension for this court is little bigger than that of the red mini tennis court. The tennis balls are orange in color and they are little harder in material as compared to the red courts. But they still come with very little bounce so that you can control your shots and get better grip on these balls. The racquet dimensions are also little higher. The little players get a better chance and opportunity at orange courts to improve their skills and advance their gameplay. Click Here to Buy Orange Mini Tennis Court Net Online. Click Here To Purchase Orange Mini Tennis Ball. Click Here To Get Orange Mini Tennis Court Racquet Online. If you are already above 9 or 10 years old or more, then you are eligible to play on green mini tennis court. The size and dimension for this court are equal to the sizing and dimensions of the regular tennis courts. The ball at this court is green in color and it is same for both singles and doubles tennis matches. Racquet sizing is also higher and green tennis balls are slightly softer than the regular compression yellow tennis balls. This is one step closer to learn professional tennis and improve your tennis skills to the next level. Click Here to Buy Green Mini Tennis Court Net Online. Click Here To Purchase Green Mini Tennis Ball. Click Here To Get Green Mini Tennis Court Racquet Online. Yellow tennis courts are used for the kids who are 11 years old or more than that. Yellow coloured compression tennis balls are used to play on such courts. Full size tennis racquets and regular professional level tennis balls are used at this court. This is the last level where you will learn tennis to your full capability and will begin playing professional level tennis matches from this stage onward. 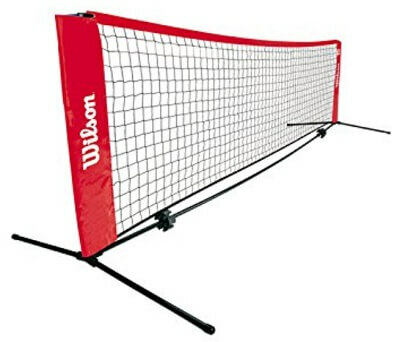 ​Click Here to Buy Regular Tennis Court Net Online. Click Here To Purchase Yellow Tennis Balls. Click Here To Get Regular Sized Tennis Racquet Online. So, these are basically 4 important types of mini tennis court dimensions. If you are a kid or you have a kid who wants to start learning tennis, then this is an important guideline to remember while playing tennis on these courts. 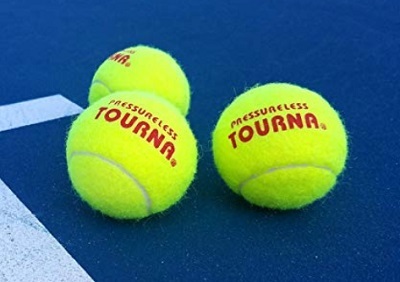 As per the official “Rules of Tennis” publication by ITF , there are certain sizing rules and regulations set by International Tennis Federation organization. Some of the most important regulations are as follows. 1. The standard tennis court must be rectangular in shape. 2. The length of the tennis court must be 78 feet for singles as well as doubles tennis matches. 3. However, the width for the court is different for singles and doubles matches. It is 27 feet for singles and 36 feet for doubles matches. 4. The height of the central net must be 3 feet in the center and 3.5 feet at the net posts. 5. The maximum permissible diameter of the metal cable or the cord which is used to extend the net on both the sides, must be 0.8 cm (8 mm or 0.3 inches). 6. The width of the strap used on the net must be 5 cm. 7. The width of the band used in the net must be in between 2 inches to 2.5 inches. 8. Servicelines on the court must be drawn parallel to the tennis net at the distance of 21 feet from the net on both the sides. 9. Every baseline is divided into two equal parts with the help of a centre mark which is usually 4 inches in length. 10. Both the centre mark and centre serviceline are 2 inches in width. 11. All the other lines that are drawn on the tennis court are often 1 to 2 inches in terms of their width. On the other side, the base lines are 4 inches in width. 12. All of these lines that are drawn on the court are of the same color and in contrast with the court surface to look distinct and clear. Indoor tennis courts are best locations for arranging tennis matches on time irrespective of bad weather, rain or cold atmosphere. Unlike most outdoor tennis courts, the indoor tennis courts offer more comfortable and relaxed playing experience for all tennis players. According to ITF regulations, there are 3 major types of court structures that are approved for indoor tennis courts. Those are Rigid Framed Buildings, Fabric Frame Structures and Air-Supported Structures. For more information related to these approved structures, you can refer to the link of ITF regulations for indoor tennis courts as provided above. Along with these 3 approved structures, there are other 4 important facilities that must be present inside each type of structure. Those four facilities are proper lighting system, right ceiling system and insulation, proper air ventilation, air conditioning and heating system and finally the perimeter curtains as well as divider netting system. 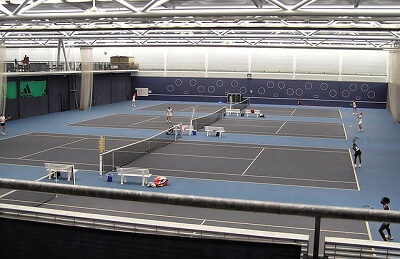 Most indoor tennis courts follow the standard or official ITF regulations. So, the indoor tennis court dimensions are also the same as that of the official tennis court dimensions. 3. For doubles indoor tennis matches, the length will be same as 78 feet but the width will be 36 feet (10.97 metres / 12 yards / 432 inches / 10972.8 mm). 4. The total distance of baseline from the central indoor tennis court net is 39 feet (11.89 metres / 13 yards / 468 inches / 11887.2 mm). 5. The total distance of service line from indoor tennis court net is 21 feet (6.40 metres / 7 yards / 252 inches / 6400.8 mm). 6. The height of tennis net will be 3 feet (0.91 metres) in the center of the tennis court and 3 feet 6 inches (1.07 metres) at the tennis net posts. 7. The minimum required height above the surface of the indoor tennis court differs depending upon the type of tennis tournament you play. Those height changes are as mentioned in the following section. a. 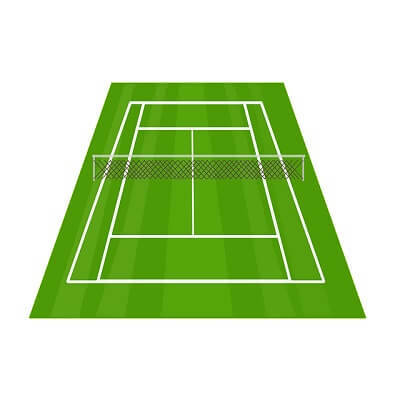 For recreational tennis matches, the minimum surface height is 9 metres for tennis net, 6.10 metres from baseline and 4.88 metres from backstop. b. Similarly, in most tennis tournament level matches, the minimum height is 12.19 metres from tennis net, baseline as well as from backstop. c. And in Davis Cup matches, this height is usually minimum 9 metres from baseline, tennis net and backstop. 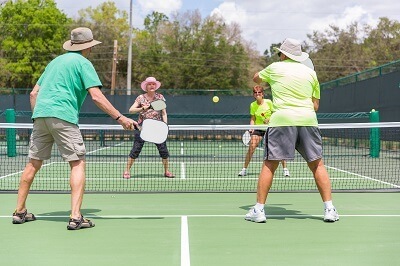 Pickleball, as it was unheard of 10 years ago, now is gaining popularity among senior tennis players. Adult tennis players are showing lots of interest to play this new, unique and easy to play twin tennis game. As per the information provided on the USA Pickleball Association (USAPA) website, it is a fun game just like tennis and offers a lot of comfort for beginner level tennis players. Though it is easy to play, it does offer challenges for more seasoned players. It is somewhat a new sport which we can describe as an ideal combination of tennis and badminton. The size of its court is almost equal to the size of badminton court. As far as the exact court dimensions are concerned, the court size for pickleball sport is somewhat smaller as compared to the standard tennis court dimensions. The court size for pickleball is 44 feet in length and 20 feet in width including all lines. It is the same dimension for both singles as well as doubles pickleball matches. On the other side, regular tennis court size is 78 feet in length and 27 feet in terms of width for singles matches. For doubles tennis matches, it is 78 feet in length and 36 feet in width. The net height for tennis matches will be 3 feet or 36 inches in the center. For pickleball matches, the net height in the center would be 2.83 feet or 34 inches. The total distance of baseline from center net would be 22 feet in pickleball courts and it would be 39 feet in regular tennis courts. 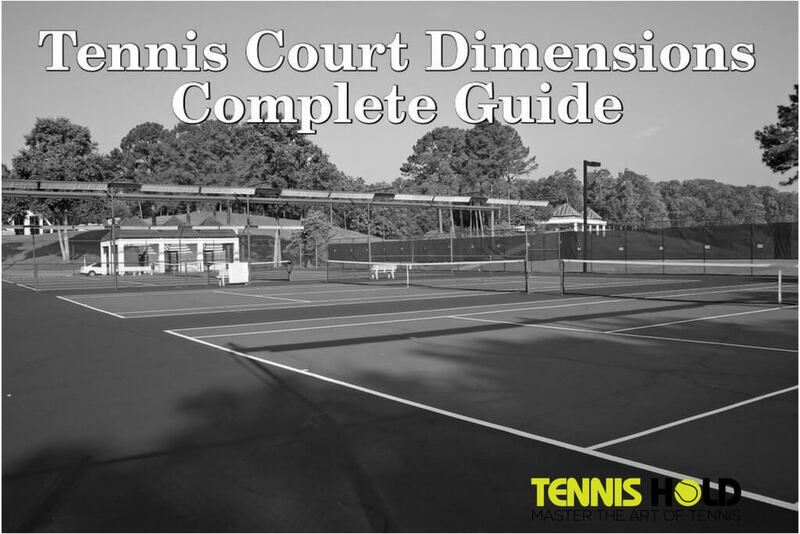 These are some of the major differences in terms of court dimensions when we compare both tennis and pickleball courts. Please visit official USAPA website to learn how you can setup your pickleball court on already available tennis courts. When you are playing on the indoor tennis courts or playing in low light conditions on the outdoor courts, there is proper lighting system needed on the courts. In the absence of natural light, the lighting system on the court offers lots of benefits such as you can play your game without interruption of low light and can finish the game in time. To make sure there is proper visibility on the court, ITF association has provided few important guidelines which one needs to follow properly. To read these guidelines, kindly visit official ITF website. While constructing lighting setup, one must also take note of external factors such as topography, climate and soil condition of the tennis court. Generally, for singles and doubles recreational and residential tennis courts, the length of lighting setup would be 10 feet (120 inches). And the width for the same would be 5 feet (60 inches). In case of dual recreational and residential courts and for tennis tournaments, the length and width would be 10 feet by 10 feet (120 inches both). 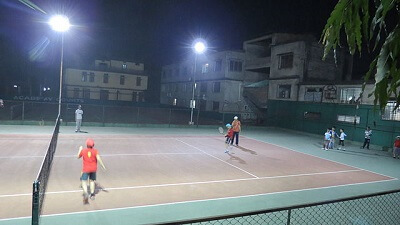 For singles tournaments and club tennis courts, it would be same as that of singles residential tennis courts. As far as dual narrow recreational and residential tennis courts are concerned, it would be 10 feet in length and 9 feet in width. But for dual narrow tennis tournaments and club courts, the width would be 10 feet while the length would be same 10 feet. Kindly watch the following video to get more detailed idea about actual tennis court lighting layout. 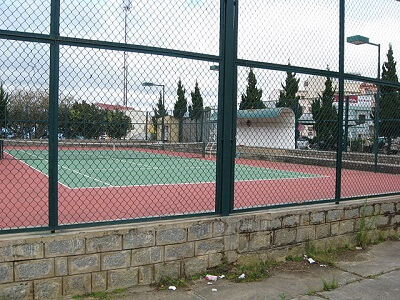 If you are looking for the information about the actual dimensions for tennis court fencing then kindly read further. The chain link fence must be installed or constructed depending upon the tennis court dimensions. You need to always remember that the tennis players need sufficient space on the court to chase the tennis ball around the servicelines and baselines. Before the back screen, you need to at least provide 21 feet of space on both sides of the tennis court net. At the same time, there must be a setback of at least 12 feet for the side screen on both sides of the tennis court. So, if you calculate both of these space requirements, then you will come to know that we must maintain fence line dimension equal to 120 feet in length and 60 feet in terms of width. This tennis fence will obviously be constructed on the side screen and base back screen of the court. The height of this chain link fencing is also important to know. Usually, this height is 10 feet for regular tennis courts. You can keep this height up to 6 feet in the area of two service lines of the court. Therefore, if you consider all this information, then you will realize that you need a tennis court fence layout which is 218 feet in length and 10 feet in height. You can also install a short fence with a dimension of 82 feet of length and 6 feet of height. For more detailed information regarding tennis court fencing layout kindly visit Fencesupplyinc.com. So, friends this is it. This is my ultimate guide for tennis court dimensions and its actual layout. We have learned what is the official ITF regulated tennis court layout and dimension. Then we delved into mini tennis court dimensions where we learned more detailed layout dimensions for red, orange, green and yellow mini tennis courts. After that we studied more detailed information regarding other important tennis court sizing guidelines provided by ITF. Indoor tennis court dimensions are also important to study which we covered after this point. After this section, we did a comparison in between pickleball court and tennis court dimensions. And in the end, we did review about the actual dimensions required for tennis fencing and tennis lighting layout that is required on the court. So, this is all I can think of right now. I will cover more points in the future as and when I acquire more knowledge. See you soon in the next guide.